The hijab, an item Muslim women wear to express modesty taught within their faith, might seem oppressive to people outside of this faith. This is why Nazma Khan created World Hijab Day in 2013 to be celebrated annually on the first day of February. Through this day, she hoped to bring understanding and tolerance. When I was in school, I didn’t see any of my classmates wearing a hijab nor were there any women I knew outside of school who wore one. My first opportunity to get to know a young lady who wore a hijab was during my first year in the classroom. I was teaching middle school English in a suburban district outside of Indianapolis. I had one African American boy and one Hispanic boy and the rest of my students were Caucasian until a few months into the school year when I was told a new student was enrolling. This student moved to the United States with her family from Saudi Arabia and she wore a hijab. She was the first minority female student I’d taught and I wasn’t prepared for how to deal with the other students’ discomfort with her appearance. The students were nice and smiled at her, but no one wanted to work with her and I overheard mumbling about why she came to school completely covered with a weird scarf over her hair. I wanted her to become part of our classroom community but didn’t know how to facilitate this as a first-year teacher. At first, I hoped it would blow over and students would work with her, but when it didn’t I knew I had to take action. One day, I asked her what she wanted people to know about her and her country. In Saudi Arabia, she had only attended school with all girls, so she was still getting used to being in a co-ed class and she wasn’t comfortable talking to the class about herself, but she said I could. I shared a brief background on where she was from, how this was her first co-ed class, and why she dressed modestly. Afterwards, I noticed that my female students started working with her during small group time. They finally saw her as just another 8th-grade girl who happened to wear a hijab. 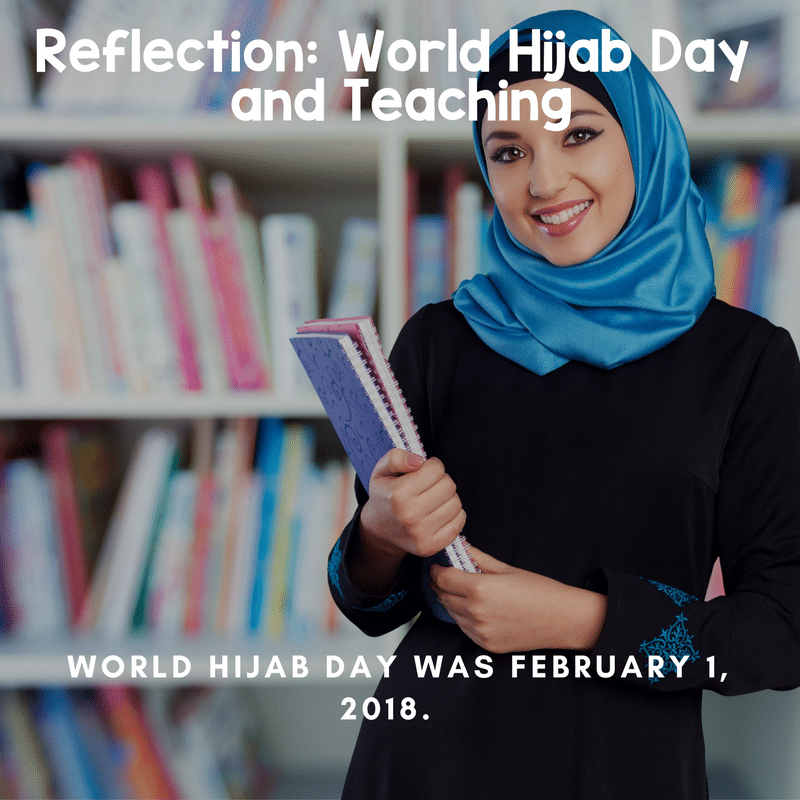 It was years until I had another student who wore a hijab, but my students had been in school with her in elementary school so I didn’t need to address why she wore one. That is how it should be, a non-issue. Since some people judge hijab-wearing women and even feel uncomfortable around them, World Hijab Day is needed. It is easy to think women who wear hijabs are oppressed when you do not know anyone personally who wears one. The three students I met thus far during my career wanted to wear their hijab to be modest and to express their faith. They came to school to obtain an education, not to be judged. Educators have a responsibility to ensure all students feel accepted and part of the school community. Teachers might have to step out of their comfort zones or become informed about something they know little about. But if educators don’t make this effort, their non-action will show other students they don’t have to make any effort either.